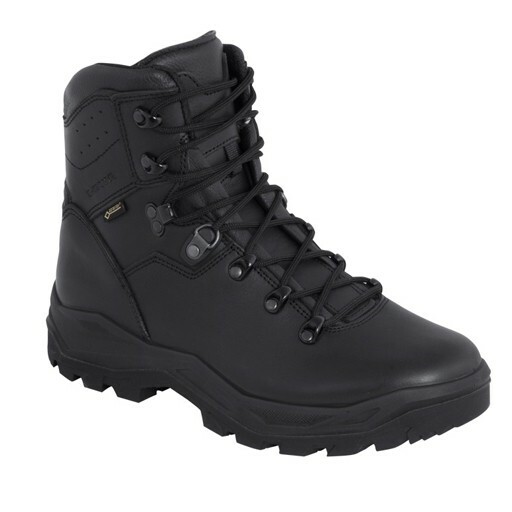 Description Waterproof duty boot with GoreTex membrane. Suitable for duty work in any weather and any terrain. The foot gets the support it needs and weighs a very reasonable 1,200 g. Outer: Smooth leather, the edge of the shaft and tongue of Teflon coated Cordura (dirt- and water-resistant). Padded tongue and scree collar, waterproof panels. Shock absorbing midsole of polyurethane, grippy Vibram outsole. Material: leather 1,8-2,0 mm Lining: GORE-TEX® Extended Comfort Sole: Gummi (Lowa Patrol) Made in EU.